Arachidonic Acid: The NEW Mass-Builder! Take a back seat testosterone because post-exercise inflammation is the key to muscle growth! The following list chronologically depicts what occurs to arachidonic acid after a muscle is damaged from exercise. Learn about this and more. Take a back seat testosterone because post-exercise inflammation is the key to muscle growth! Actually, I'm not that quick (or dumb) to negate the obvious anabolic effects of testosterone, but I will present clinical research that will restructure your thinking about the importance of post-exercise inflammation in terms of muscular hypertrophy. In fact, the age-old adage "no pain, no gain" may hold much more truth than you'd previously thought. During my past life (i.e., living in and attending college in beautiful Waco, TX... hint of sarcasm for those who've visited) I personal-trained at a popular local gym. I'd opt to weight train clients at a moderate exercise intensity (i.e., 10-12 reps for 60-65% 1RM for readers like me who want numbers) in order to prevent post-exercise stiffness and inflammation. My rationale for doing so was two-fold in that I actually wanted my clients to want to come back for subsequent training sessions and I believed that gym conservatism in exchange for consistency would elicit favorable results. One lethal flaw that I did observe with my conservative preaching was that the male clients who became consistent with training weren't gaining a substantial amount of strength or size. I had become pigeonholed in thinking that training lighter meant dodging the bullets of overtraining and the bleak feeling of delayed onset of muscle soreness (DOMS). While overtraining (albeit poorly defined and commonly misunderstood) is a conceivable danger to those that habitually perform volumous and/or intense training sessions, I came to the recent realization that the 'pigeonhole' of inflammation, while very narrow (in the sense that exercise researchers often overlook its importance), was in fact an exquisitely deep rabbit hole. From a bird's eye perspective, the concept of the "no pain, no gain" paradigm is simple: a training stimulus that does not elicit localized inflammation and soreness will not yield optimal muscle growth. So, what about arachidonic acid's role in muscle inflammation? Well for starters, arachidonic acid (AA, 20:4n-6) is an essential Omega-6 (1-6) polyunsaturated fatty acid that is abundant in skeletal muscle membrane phospholipids (figure 2). It is also the body's principle building block for the production of prostaglandins, which are known to have various physiological roles including a close involvement in inflammation. Furthermore, recent evidence suggests that the prostaglandin isomer PGF2a has a potent ability to stimulate muscle growth. As such, arachidonic acid is a regulator of localized muscle inflammation, and may be a central nutrient controlling the intensity of the anabolic/tissue-rebuilding response to weight training. 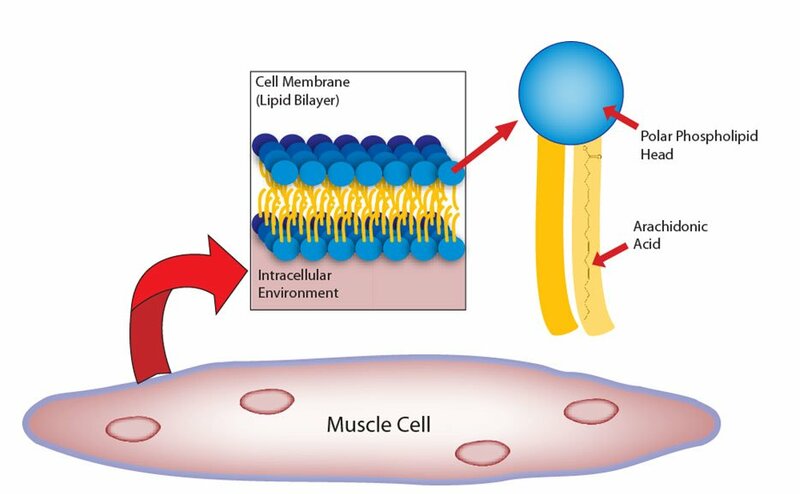 Phospholipids Of The Skeletal Muscle Membrane. Although the concept (and feeling) of post-exercise inflammation is familiar to many of us, the nuts and bolts of post-training inflammation are indeed a bit more complex. In short, arachidonic acid is a very important compound due to its widespread role in the cell signaling that leads to growth. It just sort of seems like using heat cream is bad, plus, a logical thought of sending more blood to an inflammed area would be detrimental? To rewind a little, there are certain signal transduction pathways that are initiated within skeletal muscle by the binding of exercise-responsive hormones (such as GH and/or IGF-1) to complementary receptors (2, 3, 4, 5). These pathways have been purported to up-regulate the expression of contractile proteins as well as induce the assembly of ribosomal machinery, thus increasing the fractional protein synthetic rate. These are, of course, events that are indicative of muscle growth. The process by which nitrogen from amino acids is linearly arranged into structural proteins through the involvement of RNA and various enzymes. Protein synthesis is muscle growth. The more efficient you can make this process the more efficiently you can build muscle. The activation of cytosolic phospholipase A2 (or cPLA2 which is an intramuscular enzyme) occurs. cPLA2 causes the release of arachidonic acid into the cytoplasm (or internal portion) of the muscle cell. Another enzyme coined cyclooxygenase-2 (COX-2) catalyzes the multi-step synthesis of prostaglandins (i.e. PGE2, PGF2a) which are leached from the cell and initiate various physiological events (i.e. vasodilation and inflammation). Prostaglandins (specifically the PGF2a isomer) also bind to prostanoid receptors on skeletal muscle and are proposed to initiate signal transduction cascades leading to muscle growth. Leading To An Increase In Gene Transcription. Arachidonic acid and PGF2a have been shown to facilitate ribosomal assembly in smooth muscle tissue by activating downstream proteins of the phosphoinositol-3 kinase complex (9). 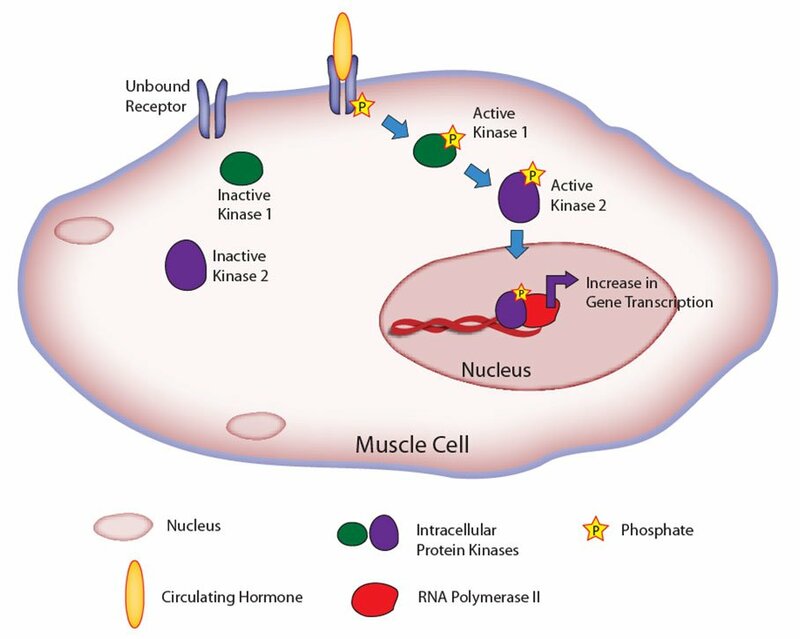 Keep in mind that ribosomes synthesize contractile proteins in skeletal muscle using the information provided by messenger RNA transcripts. While this may seem relatively insignificant, PGF2a signaling is mechanistically similar to the IGF-1 signaling cascade, which is known to induce skeletal muscle hypertrophy. Case in point: a classical study conducted by Dr. Todd Trappe at Ball State University (10) examined the effects of whole-body protein synthesis in 24 males receiving either the maximal over-the-counter doses of COX-2-specific inhibitors (which blunt arachidonic acid to prostaglandin biosynthesis) including ibuprofen (1,200 mg/day), acetaminophen (4,000 mg/day), or a placebo after completing 10-14 sets of 10 eccentric leg extensions at 120% of each participant's concentric one-repetition maximum. Will ibuprofen affect protein synthesis less if I just take the pills in the morning and at night? Is it going to seriously hurt gains? Interestingly, twenty-four hour post-exercise intramuscular protein synthesis rates increased 76% in the placebo group whereas protein synthesis remained unaltered in the two groups receiving ibuprofen or acetaminophen. Similarly, a 24-hr post-exercise elevation in intramuscular PGF2a levels in the placebo group (+77%) in comparison to the ibuprofen (-1%) and acetaminophen (-14%) groups was observed. This study seemed to provided the first compelling evidence for the involvement of arachidonic acid and PGF2a in muscle protein synthesis. While a nutritionist may discourage the use of supplemental AA due to its loose association with low-grade cardiovascular inflammation, resistance-trained folks (not sedentary couch potatoes) shouldn't worry about consuming AA baring that he/she doesn't present hypertensive symptoms, or have a history of cardiovascular or inflammatory diseases. View Arachidonic Acid Sorted By Top Seller Here. In fact, a recent study conducted at Baylor University demonstrated that AA supplementation favorably reduced a circulating pro-inflammatory cytokine (interleukin-6) that is associated with cardiovascular disease and muscle protein breakdown, while causing trend increases in resting PGF2a and PGE2 levels (which are seemingly anabolic to say the least) (11). [ Click here to learn more. ] Bodybuilding Is A Science! Many people believe that bodybuilding isn't a science. They believe it can be made simple and just going to the gym is sufficient to build the dream body. Also remember that resistance-training stagnancy (albeit a multi-factorial phenomenon) may be partially due to the lack of AA present within muscle as a result of increased activity levels (back to the "less AA = less post-exercise prostaglandin formation = less post-exercise muscle protein synthesis" paradigm). So at this point of the article you may be thinking, "Okay, is this guy trying to cover up AA's fallacies with smoke and mirrors?" The truth is that while some of the data supporting the reduction of dietary arachidonic acid may (key word here) help scientists and practitioners save a morbidly obese person's life, it shouldn't be factored into your decision-making in regards to trying AA for yourself. Conversely, you should research whether or not your potential supplement-of-interest has influenced hemodynamic (i.e., heart rate and blood pressure) and/or clinical safety markers in the blood (i.e., whole blood counts, lipid panels, liver enzymes, kidney function, etc.) before use. In this regard, the folks at Baylor found that AA supplementation didn't affect any of the aforementioned safety markers when the supplement was taken at the maximum recommended dosage (1,000mg daily) for 50 days. With this being said, if you do not fit the population described in the Baylor study (i.e. you present high blood pressure, cholesterol, inflammatory disease etc.) or you do want reassurance, then it would be advised to consult your physician prior to investing in AA or any supplement for that matter. Come to appreciate post-exercise soreness; it's a great indicator of muscle growth. Avoid over-the-counter anti-inflammatory medications after working out due to evidence demonstrating decreases in muscle protein synthesis. It may be wise to supplement your diet with arachidonic acid. 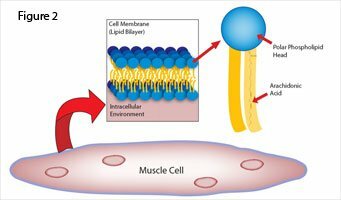 Past research has shown that trained men (albeit endurance-trained) presented a 42% decrement in the skeletal muscle cell membrane ?-6: ?-3 ratio (1). Translation: an increase in activity levels depletes ?-6 fatty acid levels from skeletal muscle that are available for prostaglandin synthesis, further necessitating arachidonic acid supplementation. AA supplementation has been shown to be safe with healthy resistance-trained subjects. Andersson, A., A. Sjodin, A. Hedman, R. Olsson, and B. Vessby. Fatty acid profile of skeletal muscle phospholipids in trained and untrained young men. Am J Physiol Endocrinol Metab. 279:E744-751, 2000. Aronson, D., M. D. Boppart, S. D. Dufresne, R. A. Fielding, and L. J. Goodyear. Exercise stimulates c-Jun NH2 kinase activity and c-Jun transcriptional activity in human skeletal muscle. Biochem Biophys Res Commun. 251:106-110, 1998. Boppart, M. D., D. Aronson, L. Gibson, R. Roubenoff, L. W. Abad, J. Bean, L. J. Goodyear, and R. A. Fielding. Eccentric exercise markedly increases c-Jun NH(2)-terminal kinase activity in human skeletal muscle. J Appl Physiol. 87:1668-1673, 1999. Boppart, M. D., S. Asp, J. F. Wojtaszewski, R. A. Fielding, T. Mohr, and L. J. Goodyear. 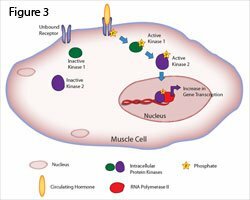 Marathon running transiently increases c-Jun NH2-terminal kinase and p38 activities in human skeletal muscle. J Physiol. 526 Pt 3:663-669, 2000. Glass, D. J. Molecular mechanisms modulating muscle mass. Trends Mol Med. 9:344-350, 2003. Griendling, K. K., D. Sorescu, B. Lassegue, and M. Ushio-Fukai. Modulation of protein kinase activity and gene expression by reactive oxygen species and their role in vascular physiology and pathophysiology. Arterioscler Thromb Vasc Biol. 20:2175-2183, 2000. Levonen, A. L., R. P. Patel, P. Brookes, Y. M. Go, H. Jo, S. Parthasarathy, P. G. Anderson, and V. M. Darley-Usmar. Mechanisms of cell signaling by nitric oxide and peroxynitrite: from mitochondria to MAP kinases. Antioxid Redox Signal. 3:215-229, 2001. Lu, J., T. A. McKinsey, R. L. Nicol, and E. N. Olson. Signal-dependent activation of the MEF2 transcription factor by dissociation from histone deacetylases. Proc Natl Acad Sci U S A. 97:4070-4075, 2000. Rao, G. N., N. R. Madamanchi, M. Lele, L. Gadiparthi, A. C. Gingras, T. E. Eling, and N. Sonenberg. A potential role for extracellular signal-regulated kinases in prostaglandin F2alpha-induced protein synthesis in smooth muscle cells. J Biol Chem. 274:12925-12932, 1999. Trappe, T. A., F. White, C. P. Lambert, D. Cesar, M. Hellerstein, and W. J. Evans. Effect of ibuprofen and acetaminophen on postexercise muscle protein synthesis. Am J Physiol Endocrinol Metab. 282:E551-556, 2002. Wilborn, C, M Roberts, C Kerksick, M Iosia, L Taylor, B Campbell, T Harvey, R Wilson, M. Greenwood, D Willoughby and R Kreider. Exercise & Sport Nutrition Laboratory, Center for Exercise, Nutrition & Preventive Health Research, Baylor University, Waco, TX 76798-7313. Molecular Nutrition is dedicated to bringing you incredible performance based prohormones backed by science!